We're definitely getting a taste of NC spring weather. The last few days have been so pretty--in the low 80s and breezy, and then today is grey, rainy, and headed into the 50s once again. Wishy-washy. That's NC weather. We did take a little time to enjoy the weather this week. The random bulb flowers have been blooming around our house. 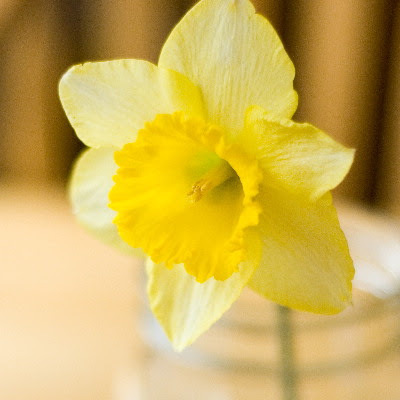 The daffodils were actually fading when we went out a few days ago, but the others will be out any time. Here is the lone survivor of the ones we picked. 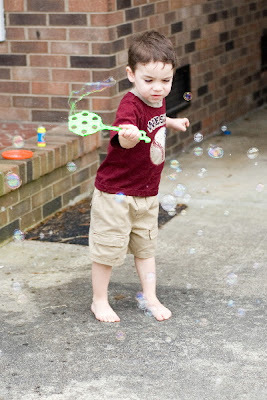 Jonathan was reminded of the wonders of bubbles at Bible study yesterday. I guess they played with all the bubble stuff when they went outside. He had much more to say about all of that than his lesson about the prodigal son. Sooo...I gave him a dollar when we went shopping yesterday (because he can only bring home so much for a dollar). He decided he didn't want anything we saw a Target, but at the Dollar Tree he walked straight up to a bubble set and didn't want to look at another thing. Works for me. 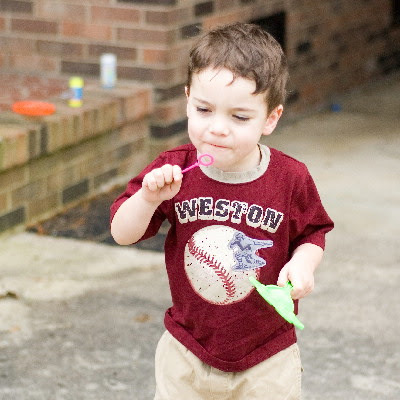 So we spent a little time (and 2 bottles of bubble solution) outside making serious bubbles. If only he could learn to actually blow. I think Jonathan looks like his Papa. (Especially in the first picture.) It sure looks like fun playing bubbles. I guess the cold weather had to return for a few days.